On Saturday fellow writer and co-founder of Greenacre Writers, Lindsay Bamfield and myself ran a workshop, 'Get Yourself a Reputation', all about creating a digital writing profile. Through preparing and running this workshop plus reading an interesting article by Emily Benet http://www.themarknews.com/articles/4875-selling-a-novel-in-140-characters I began to really think about a writing reputation and digital presence on the Internet. Imagine if you were to create Facebook pages, Event pages, Page pages, Twitter accounts, blogs. Now imagine that over a short amount of time you had built up a following of writers, a community of like-minded FB friends. What would you have? Answer: A digital reputation, a digital writing profile. And somehow even though you spend far too much time online, looking at emails, liking pages, tweeting and Facebooking and trowling through loads of useless information you have also managed to finally finish that novel. Not only could you follow a publisher using Twitter or Friend them on Facebook, you could message them and ask them to have a look at your digital presence. After all you come as a package and this includes a ready-made fan base. What do fans equal? Potential book-buyers. Your FB friends and family have become a virtual community, and this could be the deciding factor for a publisher who is deciding whether or not to take you on and publish that bestseller. This also applies if you are self published. Why? Because, you want people to buy your books. What better way to encourage them than by promoting yourself and your writing using a range of social media. All these social applications on the internet can create a reader following. As bloggers, tweeters etc we have to be aware that just as we can receive positive support we can also receive negative or downright rude comments. So Just bear this in mind, we are vulnerable out there on the net and sometimes we need a thick skin. Social media is a way to find out what is going on, the latest competitions, calls for aritcles, funding, events, promotional tools for writers; editors with something to sell. Read other peoples updates, twitters, blogs – do your research before making your own comments. Decide who you want to follow – Twitter gives ideas – you may want to search for your favourite writers – look on their websites, if they have a twitter account or use FB there will be a link which will take you direct to twitter where you can follow them. Think about your profile wherever you appear on the Internet. You are building a reputation and it is important to think about what sort of reputation you want to achieve. What are you trying to say about yourself? Always think about your ultimate aim i.e. getting published – think about that potential publisher looking at your profile. Think, eat and sleep writing. First thing in the morning, share your dreams and inspirations, post questions on Facebook - we writers love solving problems. Use the net to create a positive writing presence, a creative writing presence and build yourself a digital reputation. I've been selected as one of the volunteer judges for the Chris Evans Breakfast Show 500 WORDS competition. It will be interesting helping to judge children's stories as opposed to the Greenacre Writers short story competition which was for adults. I'm looking forward to receiving the first batch of stories. 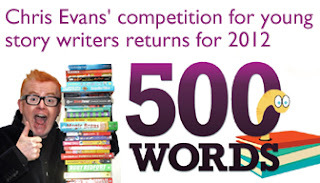 Plus as one of the judges, for BBC Radio 2's '500 words' I'll have the chance to win a pair of tickets to be in the audience for the live broadcast of the Chris Evans Breakfast Show at the Hay Festival of Literature & the Arts on Friday 1st June 2012. What time does Chris do his show? 6.30am - crumbs that's early.